Today I became brave... and sat down with one of my recent poems, and put some chords down next to the lyrics. Before I knew it, I was strumming and making up a melody as I went! I have never composed anything before... and I am really quite pleased with my very first effort. This one’s for you, Roger and Fraser!! Now, six months later, with a new little (and might I add, sleek and beautiful) guitar in my hands, I am able to reach several chords, and play along to a few tunes. It has helped me immensely to take private lessons outside of York, as I wanted to be sure I would achieve this before the end of the term. I can play A major, A minor, C, a modified F, G, D major, D minor and E minor. I have learned that my strength lies in reading chord blocks and not tablature, just yet. But I do know that Tab helps us with fingerstyle playing, identifying for us which Fret we should be on, on each respective string. I imagine that with a bit more practise, I will be reading Tab in no time. I very much enjoyed my Guitar 101 Class! 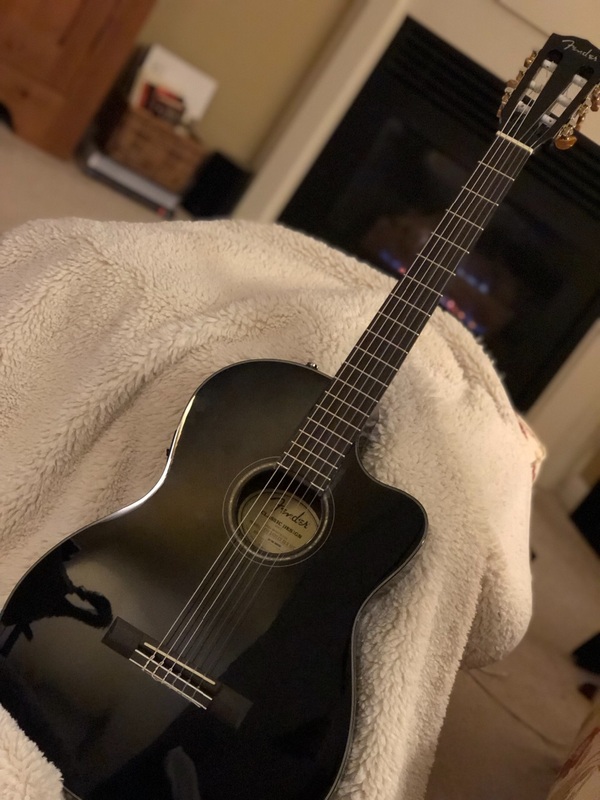 A descendent of the nylon strung Classical guitar, the steel string acoustic guitar is used mostly for playing folk music, bringing a louder, brighter sound. There are several different types of steel string guitar, and as I found out earlier in this process, one size does not fit all! I started with a large body and a wide fret board and have since downsized greatly to a beautiful slim line soundbox and narrow neck, that my fingers and arm can reach around much more comfortably. 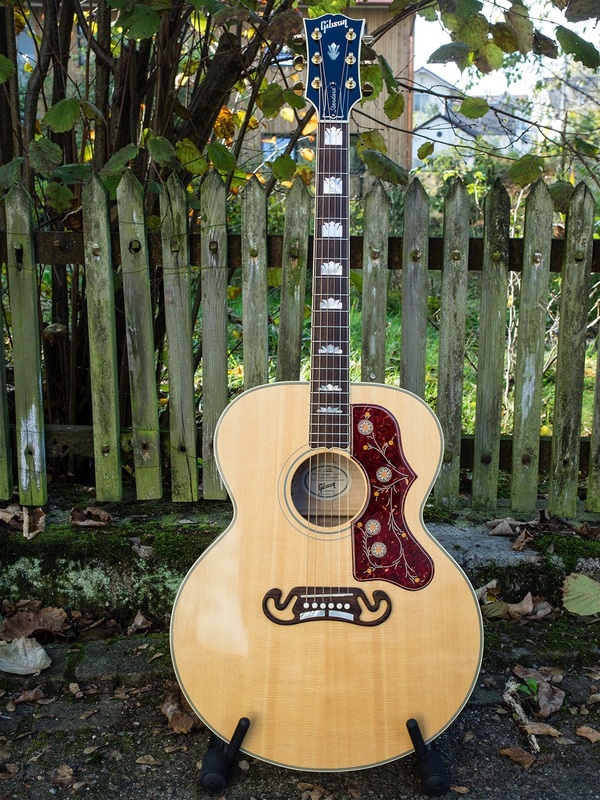 The Dreadnought - a large bodied number that has a deeper soundbox. (It is named after a warship, so it is pretty heavy-duty). I happen to have a Dreadnought at home, in a place of honour in my music room... as it is signed by none other than Jon Bon Jovi himself. The Jumbo body type is the next step up in size and has a timbre similar to the Dreadnought. The wood they are made of can vary but many are made from Sitka Spruce, which is the most common, and others are made from Alpine and adirondack spruce. Amplification can be added to these guitars by way of a clip on mic, or a detachable pickup, or a transducer which is built into the body, but they are generally played ‘unplugged’, and are popular for playing Bluegrass, Country, Folk music, Blues, and several genres of Rock music. Perhaps the most famous of all Folk Guitarists is Bob Dylan, who has had a career spanning over six decades. He is best known as a singer-songwriter, who has penned many ‘anthems’ for the Civil Rights movements of the 60’s, and who continued to write moving songs that resonated with the heart of America, and of the world. Classical Guitar is a lovely instrument, with a different sound than an acoustic guitar. This is due to the smaller size, nylon strings instead of steel, and different woods that are used to build them. The ‘action’ is fairly high. It is generally played with a gentle, fingerstyle approach. Typically Spain has been famous for Classical Guitar repertoire, with a 6 String structure, however, it originated in Italy as a 5 String instrument. As early as Vivaldi and Paganini, works were being written for Classical Guitar. Virtuoso Spanish Guitarist Andres Segovia (born in 1893, died in 1987) is credited with devising the standard Classical position and techniques, using a footstool and sitting the guitar high up on one knee. This brings the fret board closer and higher to the body, for ease of playing. Segovia transcribed many pieces for Classical guitar, as there was no real repertoire to make a full concert. A blind composer, Francisco de Asís Tárrega, (1852 - 1909) composed many pieces for Segovia to play. Segovia in turn became the teacher of John Williams, (born in England in 1941, just one year before John McLaughlin) who became another virtuoso guitarist in the Classical Style. Classical Guitar is not necessarily to be confused with the music of the Classical era! Among countless others, some famous Rock and Jazz guitarists we know who have also played Classical Guitar are Jimmy Page (Led Zeppelin) Mason Williams, and Tommy Emmanuel, who plays Classical on a steel string guitar. The lineage of these great guitarists, the teachers and students, can be traced by many, right back to Segovia himself. Liona Boyd is one of those whose guitar training is connected to Segovia. Incidentally, her grandmother was born in the same town in Spain that Segovia came from! Boyd, who was born in London UK, became a Torontonian and now lives in LA, and has added singing and songwriting to her list of talents. Boyd has also been a teacher, and in fact taught a friend of mine for some time ~ St. Catharines artist Timothy Phelan is a well-known Classical Guitarist who has made a world-wide career for himself in recent years. Touring to Asia and Europe, he plays ensemble works with other instruments such as cello and flute, (he played many Weddings for several years with my Mother, Eleanor Braun, a flutist who is now retired), and most recently, he has added Arrangements and Conducting to his arsenal of abilities. The video above is of Tim conducting a Guitar Choir, for a piece that he arranged himself. Ms Barbara Mandrell is a Country Music star who specializes in playing the Steel Guitar. This specialized guitar is set up so that it sits on a table in front of the artist, or on the artist’s lap. It has a very different sound, makes more use of vibrato and sliding than others do... The slide is a steel bar that glides across the strings on the left hand end while the right hand plucks the strings. Another guitarist who played his instrument on his lap was Jeff Healey, a beloved Torontonian who passed away at the early age of 41. His was not a steel guitar though, it was simply an acoustic guitar.